I love beverage packaging innovations, because I am a huge dork. You already knew this. 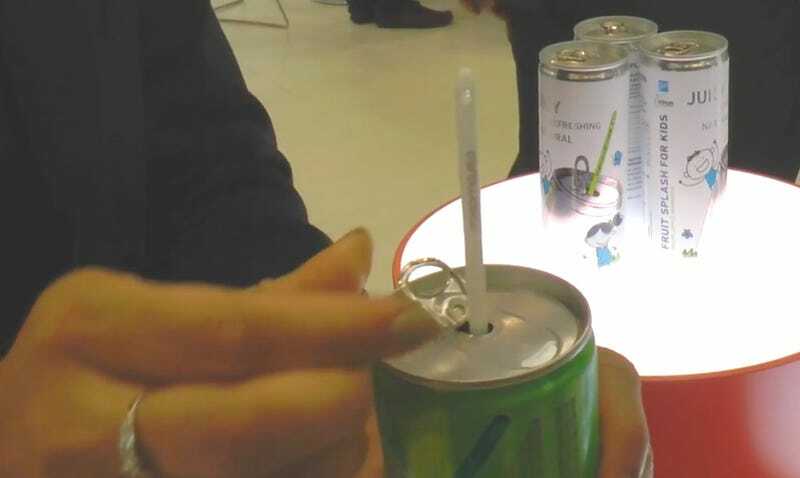 But here’s what you may not have known: Ball Corporation has introduced a gizmo called the Strawster, an aluminum can that releases a three-folded-inside plastic straw when its tab is popped. Neat-o! With the war on plastic straws waging across the country, could the Strawster be part of the solution? (It would theoretically encourage people to recycle the straw as the same time they recycle the can.) Alas, it appears to only be a part of European beverages for now. Its latest application is a partnership with NRGet, a caramel-flavored Russian energy drink. Ew. The Strawster is currently available as part of Ball’s 25cL can, equivalent to about 8.4 ounces. Its demo video (above) is pretty nifty, showing how the straw “magically” appears from inside the can when the can’s tab pops. This also seems like it would keep the straw cleaner than those push-lever straw dispensers at snack stands and counter-service restaurants. The Strawster is so snazzy, it was awarded top prize at the Euro CanTech Awards—the Oscars of the European canning industry—in 2016. So Ball, quit messin’ around with caramel-flavored Russian energy drinks and deploy this technology for the good of your own American market, k?